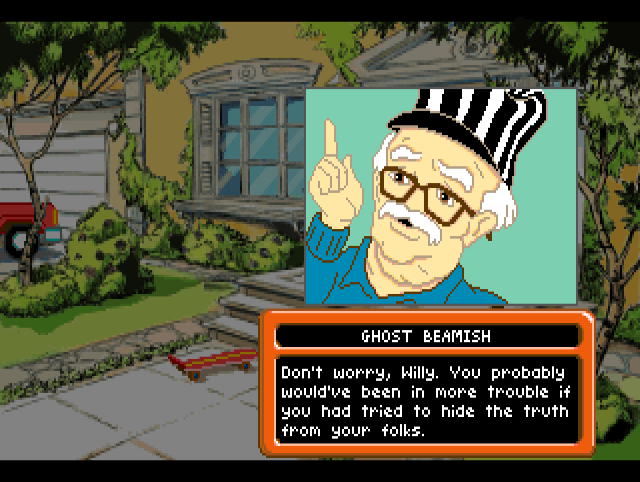 William J. Beamish Journal #1 - No more teachers, no more books, no more of Ms. Glass’s dirty looks! I made it home, and not a moment too soon! I have managed to snag my report card before my parents found out that I got a “C” in Music Appreciation. If they find out, there’s no way they will let me get to the Nintari championships! The game begins on the last day of school and Willy Beamish is in detention. His frog had jumped on the principal during a morning assembly and now he was paying the price. But Willy’s detention daydreams of winning the Nintari Championships came to a crashing end when his teacher, Ms. Glass, asked him if he was paying attention. 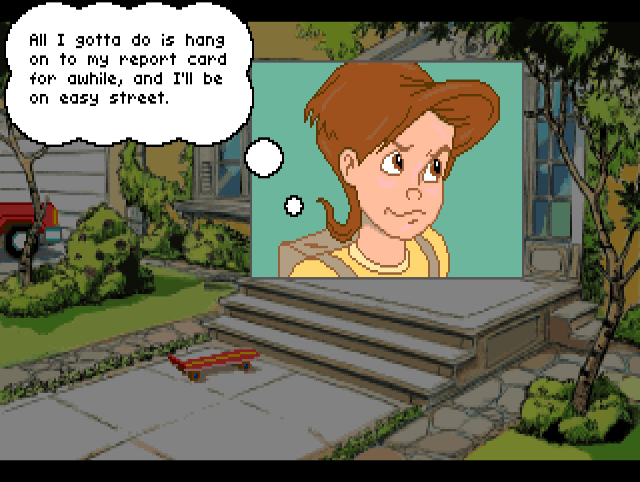 Nope, but what we have is the first task of the game, a choice between three possible responses: admitting we don’t know, making up a story about having something in our ear, or guessing that she said we could go home early. Which to pick? An adventure game consisting entirely of multiple choice questions? Before we can do anything else, Willy’s frog croaks and we have to quickly make another excuse to cover for him. This time, I can tell the truth, claim that it was “something I had for lunch”, or just deny that I heard anything. I go with the truth again (“Oh, that was just my frog, Horny.”), but the teacher thinks that I called HER “Horny” and gets very angry. 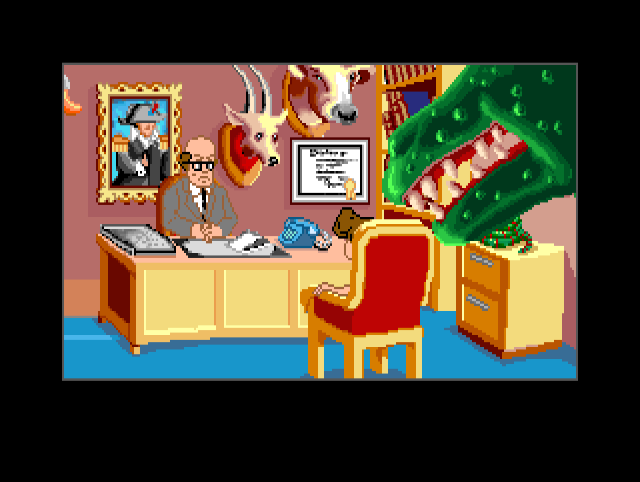 Willy offers to show her the frog, but it escapes from his hands and leaps around, terrifying Ms. Glass and causing her to jump on the desk in panic. The whole scene is pretty well animated and the characters in this game seem much more expressive than in most previous games we’ve seen on the blog. Once the whole thing plays out, I am sent to the principal’s office. 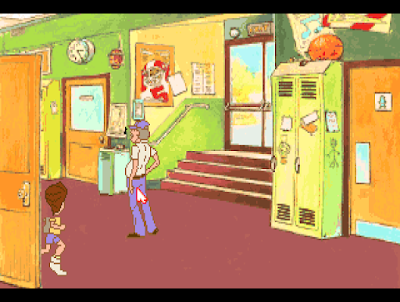 Remember kids: The principal is your pal. Willy and the principal talk for a moment, which mostly consists of him being a wise guy and making fun of Mr. Frick for not having any hair. But now that we’re here, the principal wants us to return his lost toupee. Just like before, I am prompted to select a response: making fun of the toupee, giving it back, or refusing. Is the whole game going to be like this, or just the introduction? I’m not even sure how I should be playing the game. Am I expected to be a “good kid”? Am I expected to lie? Do any of these questions matter? I go with making fun of the toupee, but he still wants it back. For the first time in the game, I can do something! The game seems to have a simpler interface than the contemporaneous Sierra games: mousing over objects in the room causes the cursor to change. For example, when I mouse over Mr. Frick, the pointer becomes a “talk” bubble. I can also right-click to get a magnifying glass which lets me look at things. Clicking on myself, I can see and interact with the items in my inventory. There might be more to it, but that’s what I found so far. 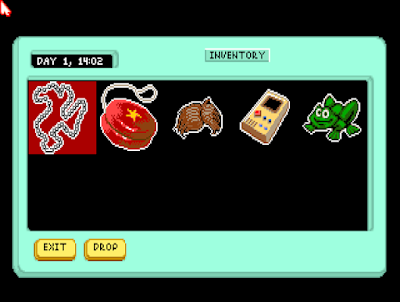 My starting inventory consists of a “G.I. Jim Dogtags Chain”, a yo-yo, a toupee, a “Gamebuddy”, and my good friend Horny. The dog tag chain (minus the actual tags; the description says that Willy lost them some time ago) is a reference to “G.I. Joe”, the action figure and cartoon series that originated in 1964. The “Gamebuddy” is a knock-off of the Nintendo Gameboy, only two years old at this point and still seen as high-tech. I select the toupee and hand it back to the principal. He puts it back on and sends me back to finish my detention. Back in detention with Ms. Gass, I am assigned to write an essay on how I plan to spend my summer vacation. As she looks on, the cursor returns and I can do stuff. But what to do? As soon as she turns her back, I can click on the door (the cursor becomes an “exit” sign) and Willy tries to tiptoe his way into the hall. She immediately catches me and moments later we are right back in the principal’s office. One brief and meaningless interaction later, we are back in detention. My guess is that this is another place where I could be forced to return his toupee, if I had not done so already. Back from that interlude, the teacher falls asleep at her desk. But before I can do anything at all, she wakes up and detention is over. I read my essay to her (Willy plans to travel to New York to win the Nintari Championships, of course), and class is dismissed. Willy puts on some cool sunglasses and skateboards home! Before I can walk into my house, the game gives me an ominous message: someone beat me to the mail! Willy has a little panic that Dad is going to “skin [him] alive” when he sees the “C”. Did I lose already? Could there be a dead end immediately at the start of the game? I have to worry that the answer is “yes” so I start the game over to try a different approach. On the bright side, if this is a dead end, it is very nice that they warn you about it! Restarting back to the beginning of the game, I try the other two answers to Ms. Glass’s first question, but both of them work out the same. Just like before, Horny makes a noise and she asks what it was that made the sound. This time, I respond that it must have been something that I ate. After a brief back and forth, she sends me to the nurse’s office! 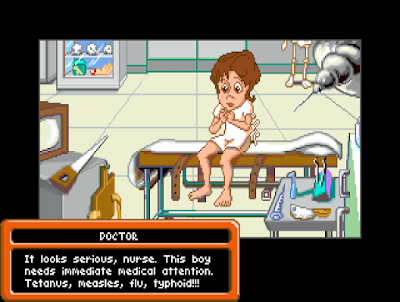 The nurse looks like a character straight out of Leisure Suit Larry, made all the more inappropiate because Willy is an elementary school kid. What is the target audience for this game again? At first, I thought that her character was a reference to the over-sexed nurse in Animaniacs, but that came out in 1993. If there is a wider trope of oversexed nurses in children’s cartoons, I am unaware of it. She makes some medical jokes and feels Willy’s chest, asking him if it hurts. I can respond either “yes” or “no”. I claim that it hurts and she does not want to take any chances: I must be taken to the hospital immediately. Once at the hospital, a doctor decides that I need a whole bunch of shots and the game ends. I am not sure why the game ends, but it does and I have to restart. The best that I could have hoped for was the nurse sending me home early, but a trip to the hospital would have taken too long. Let’s see what else I can do. On the next go-round, I try some different options but do not find anything new. I wait until the teacher turns her back and try to sneak out more quickly, but I still get caught. With the principal, I try another different tactic: negotiation. I offer to return his hairpiece in exchange for him fixing my grade in “Music Appreciation”. On the surface, this plan seems fool-proof. In actuality, he is not at all intimidated by threats by a nine-year old and calls my parents. They are not very thrilled either and decide to pack me off to military school. The end. I continue to “brute force” my way through the game, trying every option to find one that does something different. Just refusing to return the toupee to the principal, for example, is just another way to get sent to military school. Taking the other choice with the school nurse just gets you back in detention, not home earlier. I think I’ve exhausted everything I can do with them, so I must have missed something. 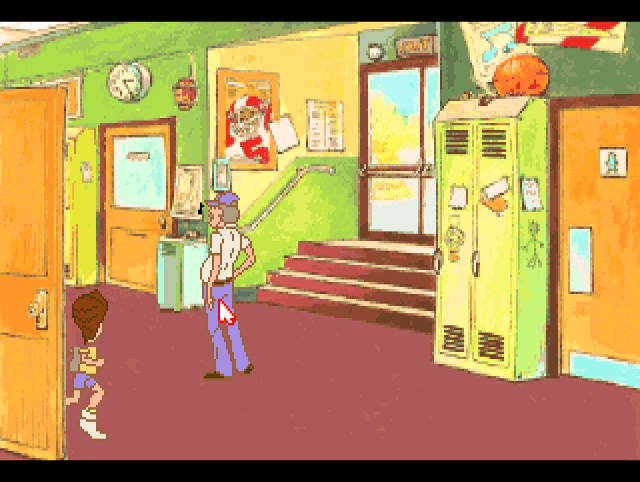 It doesn’t take long to pixel-hunt what I missed: if I mouse over the desk where Willy is sitting in detention, the cursor changes to an arrow! This is not my favorite way to solve puzzles. Clicking on the desk allows Willy to open it and see what is inside. The desk contains a mouldy sandwich, two crayons, a piece of wood, and some other stuff. Using the white crayon on the wood, I create a fake-looking “hall pass”, but do not see much else to do. I can pick up the crayons and the pass. That doesn’t help much, but it suggests that I am missing something else. But the “hall pass” is an inspiration and validation that there must be a way to sneak out. Instead of moving when her back is turned, I wait until the teacher starts to nod off at her desk before trying a great escape. That works! In the hall is a new problem: Coach Beltz. I think I’m on the right track! He asks me what I am up to and once again I have three dialog options: tell him I need to use the bathroom, that I have permission to be there, or that school is out and I am leaving. Which should I choose? I decide on the first option: I’m just using the bathroom. He wants to see my hall pass and I can pull it from my inventory. He questions how strange it looks, but assumes that it’s just a “new” one. He lets me go and I am forced to go into the bathroom. Smoking in the boys room. Inside the bathroom is a new problem: Spider, the local bully. He seems old enough to be in high school, so perhaps he’s failed a few times. He grabs me immediately and threatens bodily harm unless I live him something. Like every other interaction in this part of the game, I’m greeted with three dialog options: criticize him for smoking, agreeing to hand something over, or saying “none of your business”. I pick the second option and try to give him the toupee-- one troublemaker to another. He doesn’t like that and punches me straight through the door. The scene changes and I am in the nurse’s office with a badly bruised jaw. Willy thinks it is broken, but the nurse disagrees and sends him back to detention. I reload to try something else. Next time around, I tell the coach that school is out and that it’s time to go home. He believes me! I show him my hall pass (why would he need that if school is out?) and walk straight out the door. After the skateboarding scene, I find that I made it home on time! I can pick up my report card and now my parents will never think to wonder where it is. But this time-focus has got me thinking: It’s 4:45 PM. Is that early enough? Do I need to find a way to get home earlier? Can I get home earlier? I reload and look for faster approaches to solve the puzzles. I find that I can give the bully the “Gamebuddy” to get past him more quickly, getting home at 16:12. Willy tells him to “Try playing with yourself. It’s a lot of fun.” when he hands it over-- yet another example of the mature humor that I am coming to expect from this game. If I tell the bully that smoking is bad, he beats me up, the same as if I give him an item he doesn’t want. At least some of the time, the coach forces me to do push ups, but I am not sure why or when. I didn’t record animation here, but these are pathetic push ups. With trial and error, I find that I can make it home at 4:08 PM if I quickly build the hall pass, sneak out when Ms. Glass falls asleep (without doing anything to get sent to either the nurse or the principal’s office), tell coach that I am going to the bathroom, immediately get punched out, return to detention, sneak out again, and tell the coach that it is time to go. If I tell him that I want to leave on the first time around, he has me do pushups and then sends my sweaty self into the bathroom anyway. Since that isn’t any faster, 4:08 PM is it! At this point, I do not know if I’ve already hit dead ends. For example, I know I could give back the toupee (but I didn’t) and I know I could have given Spider the Gamebuddy (but I didn’t). If either of those two events has repercussions later, I will have to restore back to the beginning. I really hope this isn’t that kind of game! After snagging the report card, I am visited by the ghost of my dead grandfather (“Ghost Beamish”) who stresses that I need to come clean with my father. Is he supposed to be something like Willy’s conscience? Willy agrees and says that he will, but I suppose we’ll be seeing about that shortly. For literary geeks, he also warns me that something is “foul” in the city of Frumpton. This is sort-of a callback to Hamlet (Act 1, Scene 4) with the line “Something is rotten in the state of Denmark”, but I want to point out that line is spoken by Hamlet’s friend, and not the ghost of Hamlet’s father as some people suppose. Still, points for effort and a deeper joke than most in this game so far. With that, I’m going to close out this first posting. I am not sure how I feel about the game yet. The multiple choice questions are fun enough, but the game feels more like a “Choose Your Own Adventure” than a computer adventure game. I’m assuming that this is just the introduction and that we’ll have more traditional adventure game elements later, but I could be terribly mistaken. 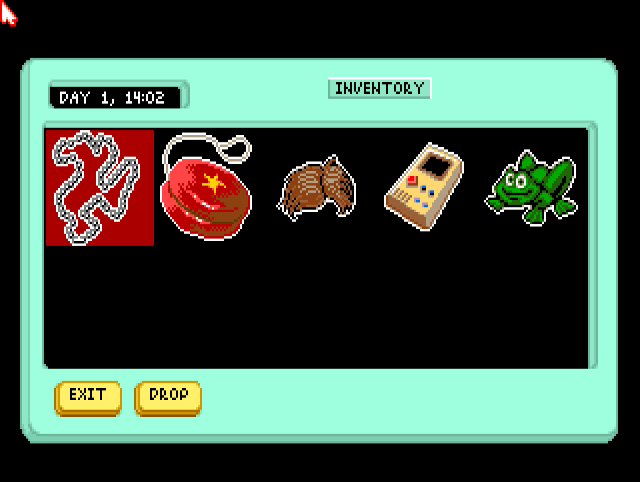 Thinking back, there has been exactly one screen where I could manipulate the environment at all, and two more where I could use my inventory screen. On the bright side, I feel pretty satisfied that I solved the report card “puzzle”. I have to find some way to change my grade on the report card. It works for Choice of Games! Choice of Games are text adventures, not graphical adventures (although they can have some graphical elements. They do generally offer multiple choice interaction but often adjust what choices are available based on stats that change depending on the player's earlier choices. I imagine the target group for the game was pretty similar as with Simpsons, which had just been few years on TV. The whole skate boarding from school to home seems reminiscent of the show's intro. That's a lot of work just for this opening section! You'll know the game inside-out by the end if you continue like this. I am very fearful of dead ends. I would have just played through, except that it gave me the warning about not getting home in time for collecting the report card. I know so little about this game, I have no idea what to expect. The game is also surprisingly information-dense, at least so far. I don't blame you Joe. Although brute force isn't really a fun way to play, I enjoyed reading how you went through every outcome to see how the game works. If this wasn't an old game that has probably already been dissected, I would say you have the beginnings of a very comprehensive walk through here. I'm not all that sure that I'm being comprehensive. The important thing for me is that the game hinted at a dead end so I needed to spend more time trying to solve it. Heck, you could consider that a GOOD game mechanic because it's better than not being told. 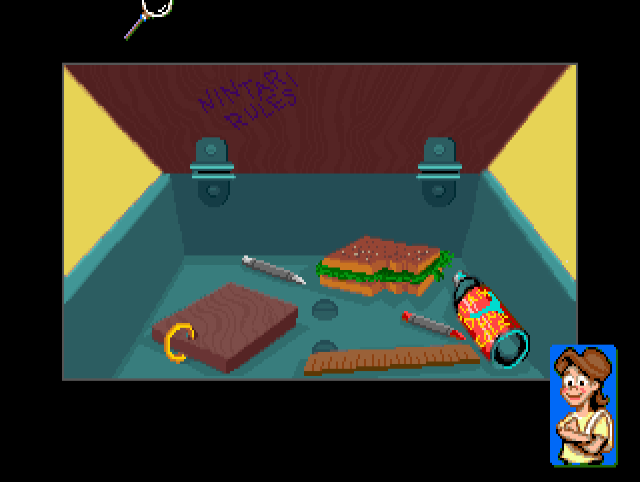 I haven't played this game pretty much since it came out (I was probably around Willy's age at the time! ), but I remember having a lot of fun. I'm pretty sure there are no real dead ends in the normal Sierra sense. If I remember correctly the game is constructed in such a way that you'll either be able to solve the puzzle in an alternate way, or the story will end in a choose your own adventure kind of way. Q1: Colonel Sanders' your grandpa?! Q2: Why does Horny look like a Battletoad?! Q3: Is there an alphabet after Z to describe the nurse's cup size? "If there is a wider trope of oversexed nurses in children’s cartoons, I am unaware of it."